Since November, a group of parents have been meeting every couple of weeks to read and discuss Homer’s Odyssey. Many of the parents are reading this for the first time, or at least the first time in many years. In addition to monthly parent training sessions, curriculum night, term presentation, concerts, and science and history projects, the parent book club provides another way for parents to engage in their children’s education and experience the richness of a classical curriculum. While the Odyssey may not be at the top of every parent’s “must read” list, it is one of the most commonly read books for students who receive a classical education. At JHCA, the Odyssey is part of the 10thGrade Humane Letters course. 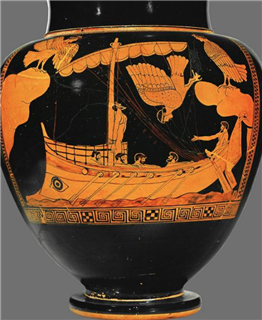 Written in approximately 800 BC by the Greek poet, Homer, the Odyssey is a comedic epic poem that retells the travels of Odysseus to his home of Ithaka following the Trojan War. The hero, Odysseus, had been away at war for ten years, and then spends another ten years trying to get home. The story includes fantastical adventures, the enduring faithfulness of a wife, the journey of self-discovery for a young man, and the ultimate affirmation of home and family. Themes of human nature, fate, love, hope, destiny, justice, and heroism present themselves throughout the story. Students, while often initially daunted by the text, find themselves getting invested in the characters and complexities of the plot – and the parents in the reading group have too.